Copper substrate is shown in the process of being coated with graphene. 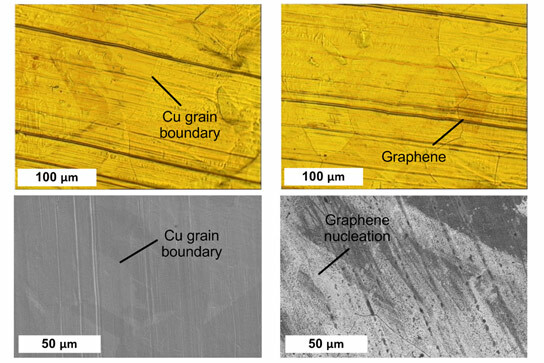 At left, the process begins by treating the copper surface, and, at right, the graphene layer is beginning to form. Upper images are taken using visible light microscopy, and lower images using a scanning electron microscope. Engineers from MIT and the University of Michigan have developed a new manufacturing process that could help bring graphene and other 2D materials to commercial products. Graphene is a material with a host of potential applications, including in flexible light sources, solar panels that could be integrated into windows, and membranes to desalinate and purify water. But all these possible uses face the same big hurdle: the need for a scalable and cost-effective method for continuous manufacturing of graphene films. Making such quantities of graphene would represent a big leap from present approaches, where researchers struggle to produce small quantities of graphene — often pulling these sheets from a lump of graphite using adhesive tape, or producing a film the size of a postage stamp using a laboratory furnace. But the new method promises to enable continuous production, using a thin metal foil as a substrate, in an industrial process where the material would be deposited onto the foil as it smoothly moves from one spool to another. The resulting sheets would be limited in size only by the width of the rolls of foil and the size of the chamber where the deposition would take place. Because a continuous process eliminates the need to stop and start to load and unload materials from a fixed vacuum chamber, as in today’s processing methods, it could lead to significant scale-up of production. That could finally unleash applications for graphene, which has unique electronic and optical properties and is one of the strongest materials known. 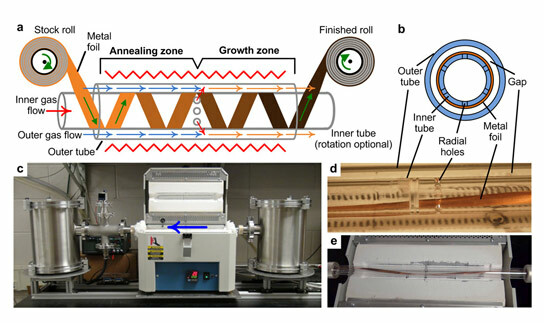 Diagram of the roll-to-roll process (a) shows the arrangement of copper spools at each end of the processing tube, and how a ribbon of thin copper substrate is wound around the central tube. Cross-section view of the same setup (b) shows the gap between two tubes, where the chemical vapor deposition process occurs. Photos of the system being tested show (c) the overall system, with an arrow indicating the direction the ribbon is moving; (d) a closeup of the copper ribbon inside the apparatus, showing the holes where chemical vapor is injected; and (e) an overhead view of the copper foil passing through the system. The new process is an adaptation of a chemical vapor deposition method already used at MIT and elsewhere to make graphene — using a small vacuum chamber into which a vapor containing carbon reacts on a horizontal substrate, such as a copper foil. The new system uses a similar vapor chemistry, but the chamber is in the form of two concentric tubes, one inside the other, and the substrate is a thin ribbon of copper that slides smoothly over the inner tube. Gases flow into the tubes and are released through precisely placed holes, allowing for the substrate to be exposed to two mixtures of gases sequentially. The first region is called an annealing region, used to prepare the surface of the substrate; the second region is the growth zone, where the graphene is formed on the ribbon. The chamber is heated to approximately 1,000 degrees Celsius to perform the reaction. The researchers have designed and built a lab-scale version of the system, and found that when the ribbon is moved through at a rate of 25 millimeters (1 inch) per minute, a very uniform, high-quality single layer of graphene is created. When rolled 20 times faster, it still produces a coating, but the graphene is of lower quality, with more defects. Some potential applications, such as filtration membranes, may require very high-quality graphene, but other applications, such as thin-film heaters may work well enough with lower-quality sheets, says Hart, who is the Mitsui Career Development Associate Professor in Contemporary Technology at MIT. So far, the new system produces graphene that is “not quite [equal to] the best that can be done by batch processing,” Hart says — but “to our knowledge, it’s still at least as good” as what’s been produced by other continuous processes. Further work on details such as pretreatment of the substrate to remove unwanted surface defects could lead to improvements in the quality of the resulting graphene sheets, he says. Hart says that while this study focuses on graphene, the machine could be adapted to continuously manufacture other two-dimensional materials, or even to growing arrays of carbon nanotubes, which his group is also studying. The research team also included Erik Polsen and Daniel McNerny of the University of Michigan and postdocs Viswanath Balakrishnan and Sebastian Pattinson of MIT. The work was supported by the National Science Foundation and the Air Force Office of Scientific Research. 1 Comment on "New High Speed Roll-to-Roll Manufacturing Process for Graphene"
While still in the early stages, this is encouraging to hear. It seems like the biggest question is whether the quality will be at the same level. While a faster process is great, you don’t want to sacrifice the quality.